Although a Bourbon monarchy had been restored in France in 1815 at the close of the Napoleonic wars it did not endure. The "legitimist" Bourbon line, disliked for their absolutist tendencies, were replaced in an 1830 revolution by the more junior "Orléanist" branch of the dynasty who consented to rule as "Kings of the French" rather than as "Kings of France". Futher revolution in 1848 saw the Orléanist King abdicate, the French kingdom being replaced by a republic to which one Louis Napoleon, a nephew of Napoleon I (i.e. Napoleon Bonaparte), was elected president. By 1852 Louis Napoleon contrived to overthrow the Republic in the name of order, and styled himself, with the consent of the French electorate, as the Emperor Napoleon III of France. "Garibaldi and the Thousand" disembarked at Marsala in Sicily on 11 May where Sicilians in revolt against King Francis II welcomed this arrival. The historic linguistic diversity of the Italian peninsula had come to be seen as being something of an obstacle to the fulfilment of Italian-National aspirations. A dynastic "House of Savoy" ruled in Piedmont where it upheld, linguistically, a principally French and Piedmontese court and administration despite having originated north of the Alps in the Duchy of Savoy (where there was a Savoyard dialect!). Pope Pius and Cardinal Secretary of State Antonelli chose to ignore such a system of guarantees and, when the first installment of monies were offered they were repudiated by Pope Pius :- "Never will I accept it from you by way of reimbursement and you will obtain no signature which might seem to imply an acquiescence in or a resignation to Spoilation." Italy was poor, since its establishment in 1861 the Italian kingdom had experienced great difficulty in balancing its budgets and the liberal, Piedmontese, administrators of the Kingdom of Italy insisted on financial responsibility. 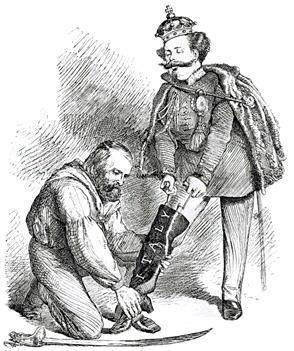 In the south there was much brigandage and insurrection and in Sicily the Italian government was probably as unpopular as that of the Kingdom of the Two Sicilies had been. In efforts to balance the books taxes were raised on salt and tobacco and more tellingly, as far as the poor were concerned, the tax on milling grain, the Macinato, which had been introduced into Piedmont by Quintino Sella in 1869 was now applied to the entire realm. Taxes were levied on mules, the omnipresent beast of burden of the peasantry, whilst horses and cows usually owned by landowners were not similarly taxed. There were many instances of serious rioting entered into against the economic policies being followed by the Italian royal administration. In cases the battle-cry of the economically distressed rioters was "long live the Pope and Austria". The birth of the Kingdom of Italy was not proving to be a straightforward affair. Newly united Italy experienced a wave of mass emigration as distressed poor people sought new and better lives in the United States and elsewhere. In many areas the masses spoke Latin dialects other than Italian: the former "Tuscan" Latin dialect that had become accepted as a literary language since the middle ages due to the impressive creativity of Dante and others. 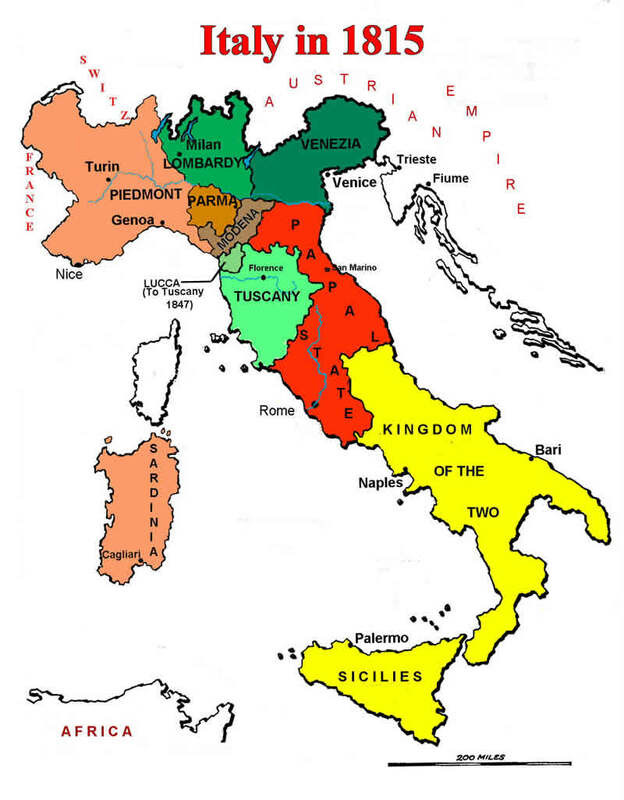 When Italy unified in the 1860s the question of languages other than Italian was never much considered (several regional dialects continue to survive as 'household' languages) and the administrative model chosen was designed to annex a dispersed and disconnected plethora of pretty states to Piedmont. The national state that emerged was centralized but weak -- precisely what might have been expected - other things being equal - to give rise to waves of peripheral resentments and mobilizations. Liberal doctrine also demanded that the laws and practices be standardized throughout the land. Piedmontese officials, bringing with them new laws and practices that inadvertently undermined the economy of the south. In the event the several states that now newly came under the sovereignty of the House of Savoy in the Kingdom of Italy did so under the existing Piedmontese constitution, under existing Piedmontese laws and existing Piedmontese foreign policy arrangements. King Victor Emmanuel II remained as King Victor Emmanuel II even though "Italy" had never had a King Victor Emmanuel previously. There were cases of resentment, in the south particularly, of the way Piedmontese organisers were deployed in rearranging aspects of the functioning of the territories newly under the House of Savoy. Why does History matter? Why do we study History? Some Social Theory speculations based on the content of our 'Spirituality and the wider World' page.